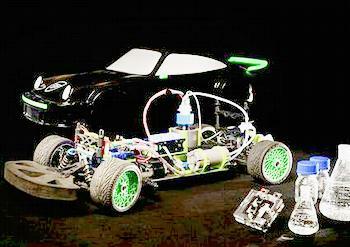 EINDHOVEN, The Netherlands, February 25, 2016 (ENS) – Team FAST, a new team of Dutch students at Eindhoven University of Technology (TU/e), is taking the first steps toward making the world’s first car powered by formic acid. The team has built a scale model, just one meter in size, that can drive on formic acid alone. By using formic acid as a fuel, the TU/e students hope to combine the strengths of electric and hydrogen powered cars without any of the drawbacks. They are demonstrating the concept by converting an existing hydrogen-powered car. Before the year is out they hope to make a bus run on formic acid. And sometime in 2017 Team FAST wants to have built the world’s first formic acid car. Formic acid – so called because ants (formica in Latin) and other insects can produce it – offers the possibility of storing hydrogen more easily and with less risk than working with hydrogen, says Team FAST. A chemical reaction, discovered last year by TU/e researchers, enables hydrogen and carbon dioxide (CO2) to be converted at high speed into formic acid, and a reaction that is reversible. Because formic acid is a liquid, the hydrogen needed for combustion to propel a car can be transported and dispensed easily and cheaply. As a gas, hydrogen is ultra-flammable. The elemental form of hydrogen gas (H2) risks autoignition when mixed even in small amounts with ordinary air – even a mixture of 4% air can ignite. The U.S.-based National Fire Protection Association assigns to hydrogen gas its highest rating, a 4 on the NFPA 704 flammability scale, under the Standard System for the Identification of the Hazards of Materials for Emergency Response. This is the “fire diamond” system of labeling used by emergency personnel to identify at a glance the risks posed by hazardous materials. It tells responders if special equipment should be used, and what precautions and procedures must be taken. Liquid hydrogen poses additional transport and storage challenges due to its increased density and the extremely low temperatures needed to keep it in liquid form. In a formic acid car hydrogen is used to power an electric engine. For the consumer using formic acid will be like using petrol, the Team says. This similarity means that formic acid fuel dispensing can fit into the existing fuel infrastructure, so formic acid can be much more widely used as an energy carrier. “Solar and wind energy can also be stored in formic acid, and then used when required,” Team FAST says. Team FAST is a multidisciplinary team of 20 students whose formic acid powered car idea earned them an Eindhoven BRAINS award for sustainability last year as well as a grant of €50,000 in the Dutch STW technology foundation’s Open Mind competition.